All fresher candidates can get the latest B.Tech Jobs 2019 from this article. Job aspirants who had completed B.Tech in various streams such as CSE, ECE, EEE, IT, Mechanical, Civil, Automobile, Aeronautical, Agricultural, Biotechnology are exploring the internet for the jobs across India (Bangalore, Chennai, Hyderabad, Mumbai, Pune, Noida, Kolkata, Ahmedabad, Gurgaon, Cochin, Bhopal, Lucknow, Vijayawada, Vizag etc.). We have created this article for the sake of candidates to give an idea about the jobs after B.Tech for freshers. Most of the candidates are seeking for the BTech jobs for freshers on the various websites. To reduce the search burden of the aspirants we are providing the latest B.Tech Job Openings at one place. Contenders can check the IT Jobs for B.Tech across India in our website freshersnow.com. In this page, we are providing a numerous number of B.Tech Job Openings 2019 for graduation completed aspirants. In the below table we are providing Jobs for B.Tech CSE Freshers, Jobs for B.Tech Mechanical Freshers, Jobs for B.Tech ECE Freshers, Jobs for B.Tech EEE Freshers, Jobs for B.Tech Aeronautical Freshers, Jobs for B.Tech Civil Freshers and other branches jobs. So check this page completely for the latest updates. We gathered Jobs for B.Tech Freshers from the various sources and equipped on this page. So candidates can choose their desired company by their interest. From the past years the IT sector is growing rapidly and today it is one of the largest booming sectors in India. In this sector, the aspirants can find the number of jobs and very high pay scale. Getting the job in the is not an easy task. Every year lakhs of B.Tech candidates are completing their education and coming out by seeking for the jobs. To help those aspirants we completely focused on the latest B.Tech Jobs 2019 and provided on this page. Generally, the B.Tech (Graduates) can find the jobs in major cities across India like Bangalore, Mumbai, Gurgaon, Noida, Chennai, Pune etc. We updated the branch wise freshers vacancies in the next section.Some companies will hire the aspirants through Off Campus Drives also. The Bachelors of Technology commonly abbreviated as B.Tech. This is a Graduate Degree awarded to the aspirant after completion of four years of academic study in Engineering. B.Tech is a skills-oriented course. In India, the Engineering Courses are regulated and set up in India under the agies of University Grants Commission (UGC) and All India Council for Technical Education (AICTE). We can choose Hardware or Software in B.Tech. In software, you have manufacturing, development, programming, software testing, and maintenance and support. And in Hardware manufacturing, maintenance, research and development, and management. Many of the MNC (Multinational Companies) such as Google, IBM, Infosys, Tech Mahindra, Yahoo, Capgemini, Mindtree, Wipro, Cognizant, HCL, Accenture are providing the vast number of opportunities for the candidates. Contenders who want to make their career bright can apply for B.Tech Jobs 2019 by checking from this article. After completing the Higher Secondary education a huge number of candidates choose the B.Tech (Bachelor of Technology) as the career option. And later on, completing the B.Tech the aspirants are in the confusion how to get the job. Not only in IT sector, the B.Tech aspirants have various job openings in Banking, Media, Journalism, Advertising, Manufacturing, Railway, Defence and more. Candidates can find Job Opportunities for B.Tech freshers like Junior Engineer, Software Engineer, Support Executive, Android App Developer, Web Developer, Computer Operator, Junior Assistant, Network Support Engineer, Assistant Manager etc. Candidates can pick the interesting position and apply B.Tech Jobs 2019. Before applying the aspirants have to check the eligibility criteria like education qualification, skills required, responsibilities, pay scale etc. In a year many of the MNC and Startup companies are offering the B.Tech Job Openings for freshers. As we all know that the candidates from various streams are searching for the B.Tech Jobs 2019. Nowadays there is high competition for the IT Jobs. So to overcome that competition the aspirants have to prepare well by using the related stuff. We are providing the complete syllabus, placement papers, interview questions on our website for the preparation. Contenders can use it and prepare in a preplanned manner. We provide the genuine information on this page. So the applicants can check IT Jobs for B.Tech freshers at free of cost at any time. Candidates can also check the other Walkins from our website. Usually, Jobs for BTech CSE Freshers are Assistant Manager, Software Engineer, Software Developer, Junior Engineer, Associate Software Engineer etc. So candidates can check the eligibility and apply for the B.Tech CSE Job Openings 2019 before the last date. And B.Tech ECE Freshers can make their future in telecommunication industry, consumer electronics, healthcare equipment manufacturing industry, mobile communication, etc. The Mechanical Engineer can go through various positions like Mechanical Engineer, Automobile Engineer, Design Engineer, Deputy Engineer, Service Technician etc. 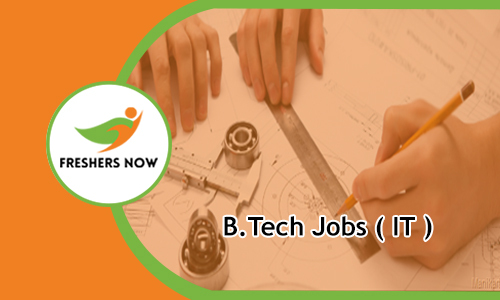 Jobs for B.Tech EEE Freshers are from various Government and Private companies like ECIL, HAL, IRCON, PGIMER etc. In these companies, the candidates hire for Tradesman, Assistant Manager, Assistant Electrical Engineer, Technician etc. Aeronautical engineers design, develop and maintain aircrafts to ensure a high level of technical precision and safe operations. Jobs for B.Tech Aeronautical Engineering Freshers are Aircraft Maintenance Engineer, Aeronautical Engineer, Ground Staff, Aerospace Engineer etc. So, in the same manner, the B.Tech candidates from various branches can apply for various B.Tech Jobs 2019 by checking from this page. For every position, we provide all the eligibility details in an understandable manner. The candidates who are looking for the latest B.Tech Jobs 2019 can be in touch with our website www.freshersnow.com.